What Is the Haqqani Network? FILE - Security forces inspect near the site of an explosion where German Embassy is located in Kabul, Afghanistan, May 31, 2017. A massive explosion rocked a highly secure diplomatic area of Kabul on Wednesday morning, causing scores of casualties. The Haqqani network is a militant group that continues to fight Afghan and U.S. forces in Afghanistan. Afghan officials and international terrorism authorities consider it the most lethal terrorist group in Afghanistan. It has been blamed for some of the deadliest violence in the country, including attacks on embassies in Kabul, the Afghan parliament building, local residents and U.S. military bases. When was the network founded? Jalaluddin Haqqani, a former anti-Soviet commander in Afghanistan, formed the network. In 1995, he pledged allegiance to the Taliban, which emerged a year earlier from a network of madrassas in Afghanistan and Pakistan. The network became a component of the Taliban and helped it capture the capital, Kabul, in 1996. Haqqani was appointed minister of tribal affairs, a position he held through 2001, when the U.S. invasion of Afghanistan ousted the Taliban. Haqqani is believed to have studied in the Dar al-Ulum Haqqaniyaa madrassa in Pakistan, which is widely known for links to, and has publicly expressed sympathies for, the Taliban. One of his two wives is from the United Arab Emirates. He is held in high regard in largely Sunni Gulf Arab states. Because of ill health, Haqqani handed over operational control of the group to his son, Sirajuddin, who also acts as deputy leader of the Taliban. Khalil al-Rahman Haqqani, a U.S.-designated foreign terrorist, is a major fundraiser for the network. He has reportedly engaged in weapons training and distribution by the network, according to a Stanford University research paper on the group. 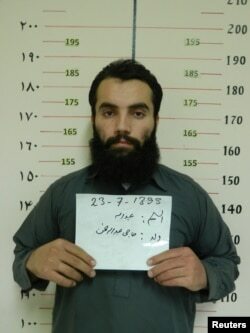 Anas Haqqani, a senior leader of the Haqqani network, arrested by the Afghan Intelligence Service in Khost province, is seen in this handout picture released Oct. 16, 2014. Anas Haqqani, Jalaluddin Haqqani's son from his Emirati wife, is in Afghan custody and has been sentenced to death by a local court. The Taliban has warned of "disastrous consequences" if Anas is executed. Where is the network based? The group is reportedly based in Miram Shah, a town in the Federally Administered Tribal Areas in northern Pakistan where it operates base camps for conducting activities, including weapons acquisitions, training of suicide bombers and logistical planning for military operations, according to media reports. Kabul and U.S. officials have long accused Pakistan's Inter-Services Intelligence of covertly providing sanctuaries to the Afghan Taliban and the Haqqani network. Pakistan denies any links. How large is the network? According to various estimates, the number of group members ranges from 3,000 to over 10,000. The network is reportedly well-funded with support from various sources, including from wealthy Arab Gulf individuals. Haqqani and his sons have frequently traveled to the Arab Gulf countries to solicit funds. Haqqani, who speaks fluent Arabic, established personal connections with many individuals and organizations in the Arab Gulf region. The network has also generated funds through criminal activities such as smuggling of Afghan mineral supplies. 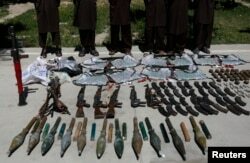 FILE - Weapons and ammunition seized are presented to the media along with insurgents suspected of being from the Haqqani network at the National Directorate of Security (NDS) headquarters in Kabul, May 30, 2013. How is the network linked to militant groups? In addition to its Taliban ties, the network has forged alliances with several militant groups, including al-Qaida, Tehreek-i-Taliban in Pakistan, the Islamic Movement of Uzbekistan and Pakistan-based Lashkar-e-Taiba, which has been accused of orchestrating a 2008 attack in India that killed 166 people. The network is believed to be holding several Western nationals, including two faculty members of American University who were abducted from Kabul last year. What are the possible links to Wednesday's bombing? "The attack has a signature of the Haqqani network," Marvin Weinbaum, an analyst at the Middle East Institute in Washington, told VOA's Urdu service. "They've pulled off some of the most dramatic attacks on Kabul over the last several years. So in that sense, you cannot separate this from the Taliban in general, because Sirajuddin, who heads the Haqqani network, is effectively the military commander of the whole Taliban. ... Of course, the Afghans will identify Haqqani because that's the link to, and they want to pin this on, ISI. Whether or not they were involved is another matter. At least that much is clear — that it probably was Haqqani network." Ariana, a local Afghan TV channel, reported that two senior members of the Haqqani network executed the bombing with the help of a Pakistani army general, a former Pakistani diplomat in Kabul. Pakistani Foreign Ministry spokesman Nafees Zakaria, in his weekly news briefing on Thursday, described the Afghan claim of Pakistan's involvement in the Kabul attack as "baseless." "We dismiss Afghanistan's allegations over the Kabul bomb attack," he said. Madeeha Anwar is a multimedia journalist with Voice of America's Extremism Watch Desk in Washington where she primarily focuses on extremism in the South Asia region.